Feel like part of the community in this quaint town setting. Robin`s Nest is a cozy 2 bedroom, 1 bathroom cottage located in the heart of Grand Marais, MN. Sit out on the front deck for great views of the Lake Superior Harbor. The spacious living room features two sitting areas, a TV, and a desk. Plenty of room for everyone and the sleeper sofa in the living room provides a second sleeping area. Curl up in front of the wood burning stone surround fireplace on a cold winter`s night. Lots of windows means lots of natural light all year long. This semi- open living space flows freely into the kitchen and dining room area. Special Note: you will now find a new dining room table against the gray wall The small kitchen is well-equipped for preparing meals during your stay. The first bedroom features a king size bed. There is plenty of room to unpack and relax in the first bedroom. The second bedroom has twin bunk beds - perfect for kids. Also with room to unpack and relax. Robin`s Nest is your Grand Marais, MN home away from home. Stay here like you live here at Robin`s Nest. Ever fantasize about living on the north shore in a small artist community? This is the perfect place to experience the simple pleasures of small town living. Live the dream on your vacation at Robin's Nest, a cozy little 2 bedrooms, 1 bathroom, single story home, located on a residential street, nestled in the quaint Grand Marais community. 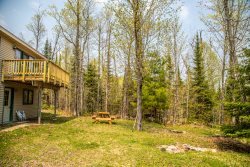 This cabin is walking distance to the Grand Marais Harbor, Angry Trout Cafe, The North House Folk School (see specials page), The Grand Marais Art Colony, and all of the ma and pa stores and restaurants that make Grand Marais unique. The cabin is roomy and fresh with a large deck for relaxing and enjoying quality family time. If it is an adventure you seek, consider Robin's Nest your base camp for your next getaway. Head down the shore 10 miles to Cascade State Park where you will find a beautiful waterfall after a short, easy hike. Up for more of a challenge? Just head 15 miles up the shore to Judge C.R. Magney State Park for a 1+ mile hike, including several flights of stairs, to view the mysterious Devil's Kettle waterfall. Here, half of the Brule River flows down a typical waterfall and out into Lake Superior. The other half goes into a mysterious hole and disappears and no one knows where it goes! Add in miles and miles of hiking, biking, skiing, snowshoeing, and snowmobiling trails and you will find adventure all year long during your stay at Robin's Nest. At the end of the day grab a bite to eat and bring it home so you can sit on the deck and watch the happenings around town. Say hello to locals and visitors alike and feel like you truly belong in this beautiful little town. Dogs are welcome with prior approval. 2 dog maximum. Cats are not allowed. We liked the roominess of the living room and the amount of counter space in the kitchen. The kitchen had everything we needed. The location was great. We have been in the Grand Marais many times, but never stayed in town before. On the minus side - the bathroom is really small and the furnace vents are really loud. Loved the location, the home, and the cleanliness. Loved that they accepted dogs. A larger saut pan and sharper knives would have been helpful for cooking. We loved the Robin's Nest, a pleasant, comfortable home, perfectly located for our weekend of activities at North House Folk School. When we arrived, we found the house immaculately clean, warm, and welcoming. Our only wish is that the living room and bedrooms had better lighting, especially for the longer winter evenings. our home was very comfortable and awesome. it was more spacous than we thought from the on-line photos. the location was perfect, being very close to downtown Grand Marais. we loved that we could bring our dog!! house is very comfortable & clean. Kitchen is well equipped and easy to cook in.